In the report format used in CQUniversity (refer to Help section below for a link to the report guide), explain how you would complete the following modelling tasks. In this report, system design and analysis for PSSM will be discussed. To support the discussion there will be several system design models for that purpose. The models will help to analyze the PSSM system from different viewpoints. There will be context diagram that will describe the context of the system, functional diagram like DFD, UML diagrams like use case, class diagram and to focus on different functions of the system there will be diagram like activity diagram, sequence diagram etc. Instead of the whole system these diagrams will focus on different activities by the system and the sequence of operation for accomplishing such activities. The context diagram will give a top view of the system. The system will be considered as a whole. The diagram shows how the system interacts with external entities. For PSSM system context diagram there will be 6 external entities, client, contract manager, staff, temporary staff, arrangement department and placement department. The diagram shows flow of information between the system and any of the entities. Level 0 DFD is developed based on the context diagram. Instead of focusing on the system, as a single entity, in level 0 DFD, it focuses on the main processes in the system and how data flows though the processes. 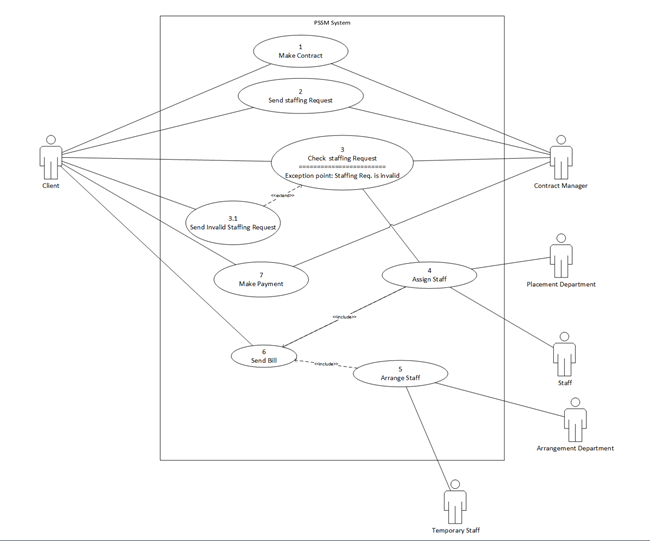 There will be external entities and data stores in the level 0 DFD diagram. In the level 0 DFD diagram for PSSM system there will be 8 processes as given in the diagram. Also there will be two data stores for master contracts and staff details. The use case diagram shows the behavior of the system when different type of use interacts with the system. The tasks performed by different types of users using the system are the different use cases. The use cases are developed from the processes in the level 0 DFD diagram. In the use case diagram for PSSM system, there are total 8 use cases, from those one is special use case that is triggered in some exceptional flow of actions. There are 6 types of users who will interact with the system. A domain model class diagram shows the classes of a system and the associations among the classes. It also shows the attributes of each class and the methods of the class. A class is an abstraction of a real world entity related to the system. There are 6 classes in the domain model class diagram for PSSM system. Following diagram shows the classes and other details. An activity diagram focused on the activities for accomplishment of some task. In the activity diagram for the scenario of making contract has two participants client and contract manager. 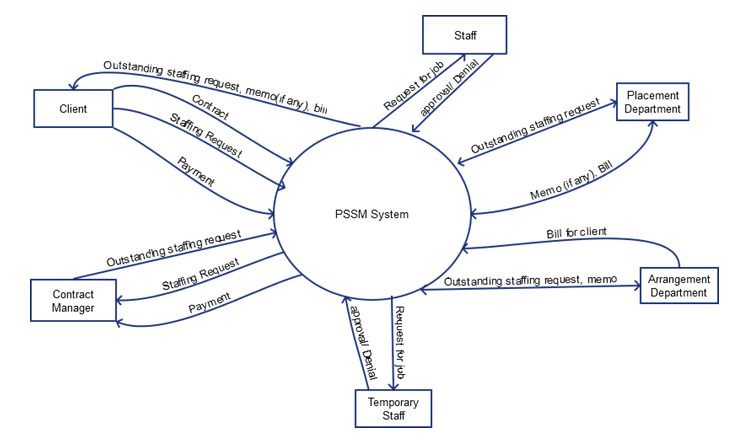 The activity diagram shows the sequence of activities for making contract and placing a staffing request at PSSM successfully. The system sequence diagram will show the sequence of actions by the system for successful completion of some task. Here, the system sequence diagram shows the sequence of action between a client and the system for placing a staffing order successfully at PSSM. There is detailed description of the system design and analysis diagrams for PSSM system in this report. Each of these diagram has its own characteristics and roles in the overall system analysis and design. The context diagram helps to understand the system as a whole in its own context. From that diagram level 0 DFD explores different processes in the system and flow if information among the processes. From these processes, the use cases are identified and use case diagram have been developed. Then there are class diagram, activity and system sequence diagram, where the system is considered as an object.